Hydro-acoustical measurements in volcanic crater lakes were first implemented for recording the noise generated by bubbles rising from underwater fumaroles (Bercy et al., 1983). The recorded signal, in a 50 to 5,000 Hz band, yields a fair estimate of the gas flow-rate from the crater floor. More generally, hydro-acoustical measurements as a geophysical tool, offers the advantage to integrate from a large area of the volcanic edifice, the ground vibrations in a much wider frequency band (from 0,1 Hz up to 200 kHz) than conventional seismometers. Indeed, the impedance match is much better between a hydrophone and the water than between, say, a geophone and the ground. Before any actual measurements were carried out, the search for ultra-sonic signals in water was suggested by the very high frequency hearing threshold of the catfish (Amiurus nebulosus), as compared with other aquatic animals (ibid). As a matter of fact, the catfish is also said by Japanese to display an abnormal behavior before earthquakes. Measurement of acoustical vibrations in the ultrasonic band (from 20,000 Hz up to 200,000 Hz) necessitated the design of a specific piezo-electrical sensor with very low intrinsic noise in the relevant band (typically lower than 20 dB ref. 1 *Pa/Hz½). Moreover, the sensor must be set up in water (lake, water well, etc) a medium in which high frequency acoustic waves are far less damped than in the ground. 3) Recently in 1998 (I.R.D.) 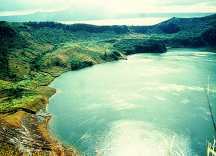 and the University of Savoie (France) with the assistance of the Vanuatu Department of Geology, Mines and Water ressources have installed a new acoustic monitoring station on lake Voui, Lombenben volcano. 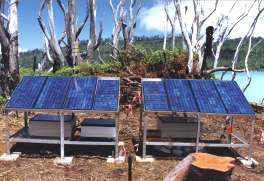 Scientists, immersed the captors and installed a set of 10 solars panel and batteries to supply power to the electronic system and the Argos transmitter which transmit information in real time. The continuous monitoring of the temperature of the waters of the lake, and the recording of acoustic signals across a very wide range of frequencies, will enable us to monitor the activity of Lake Voui in which gases have been escaping through some 50 millions m3 of water since 1995. 1) The sensor should be exceptionally sensitive, and display a good hemispherical isotropy ; 2)The sensor should be set up as close as possible to the anticipated source of stress ; 3)The sensor should benefit from the best impedance match with the vibrating medium (this can be much more easily achieved in water) ; 4) At last, the analog amplification device should display a gain higher than 120 dB and, if a frequency analysis is at stake, the signal processing device should run at a speed of the order of 1 MHz. During the 2000 campaign in the Azores, we employed a light material : hydrophon with low noise and with a large usable frequencies (until 150 Khz), a digital processing unit ( pre-amplifier, amplifier and low pass filter) a 12 bits ADC converter connected to a laptop computer. A specific software carried out the acquirement and the processing of spectral analysis. A first experiment was carried out on the volcano of Serreta at the depth of 300 m. The preliminary results showed on a curve are in agreement with the normal sea noise. A second experiment took place on the bench of Don Joao de Castro. Because an uncertainty concerning precise coordinates of the bench, we stopped outside the crater ( probably about 1 km). The acoustic sensor was immersed at the depths of 50 m of cable, but because a rough undercurrent, the real depth must not more than 35-40 m. ; The acoustic level was distincly more important than on the Serreta volcano, about one order of 15 dB in the audiometric frequencies and almost 10 dB toward 100 kHz. This decreasing gap is logical, since the absorption of the waves increasing with the frequency. Therefore, we can see that the bench of Don Joao de castro is the source of an intense acoustic signal which spreads on a very large range of frequencies, and particularly in the ultrasonic bands. This mission was very important in the field of the acoustic methods of investigation, because, although the first results obtained in the range of the ultrasonic noise are encouraging, the interpretation of the ultrasononic signal as precursors of the rewakening or the increasing of volcanic activity are not completely established yet : acoustic emissions phenomenons relating to microfracturation occuring before the rocks fracturation or mechanisms linked to the presence of hydrothermal fluids.. Development of these acoustic technicals, previously experimented in the crater lakes, in differents underwater settings such a submarine volcanoes should be allow to increase the acknowledge in this research way.